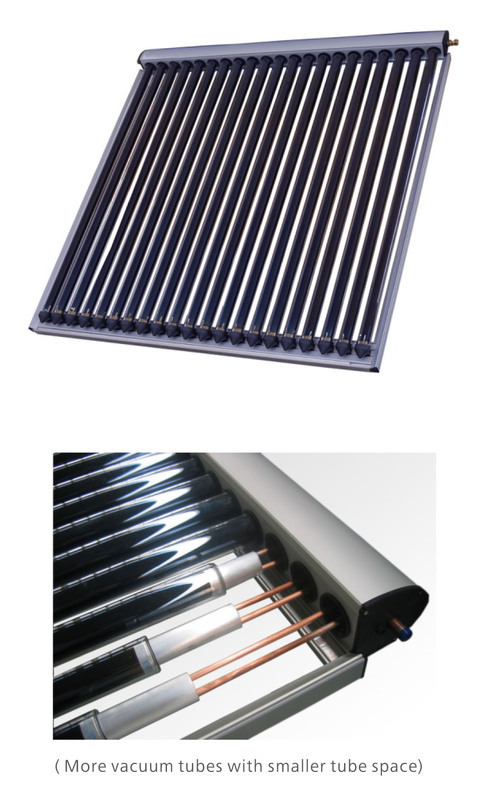 Solar Hot Water / Solar Cooling - ECS Energy Solution Co.,Ltd. 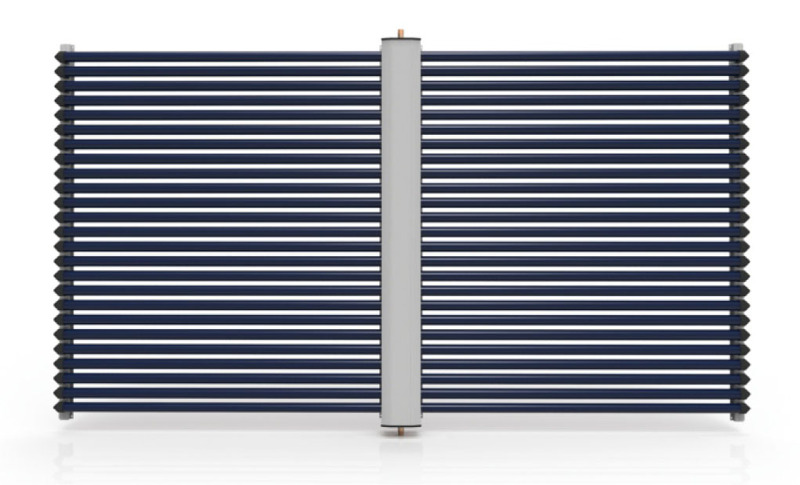 for water, space and process heating and solar cooling with 90oC ~ 130oC temperature requirement. The vacuum tube collect or with CPC-reflector has high energy yield due to special collector structure that contai ns vacuum tubes with highly selective absorber layer, U-shaped copper pipes inside vacuum tube for heat transport , aluminum heat transfer plate and highly reflecting CPC-reflector. Short installation times due to complete pre-assembel collectors. Flow and return pipes may be filled on the left or the right side of the manifold. Low pressure loss allows several modules to be connected. Minimum of soldering points ensures a high leakage safely. High energy yield in transitional period and winter. Extremely low heat loss due to the high vacuum. Quick and easy exchange of the evacuated tubes without using any tool . Simple and reliable collector connection technology. In order to increase the efficiency of the vacuum tube col lector, a highly reflecting and weather proof CPC-reflector ( Compound Parabolic Concentrator ) is placed behind the vacuum tubes . 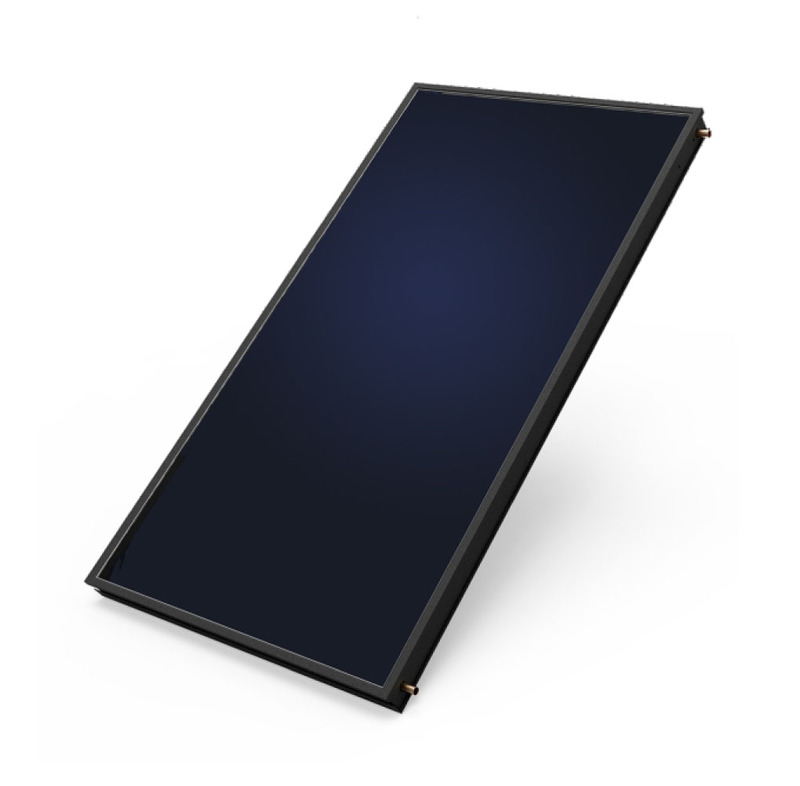 This special mirror geometry ensures that even at unfavorable irradiation angles direct and diffuse sunlight will fall onto the absorber. 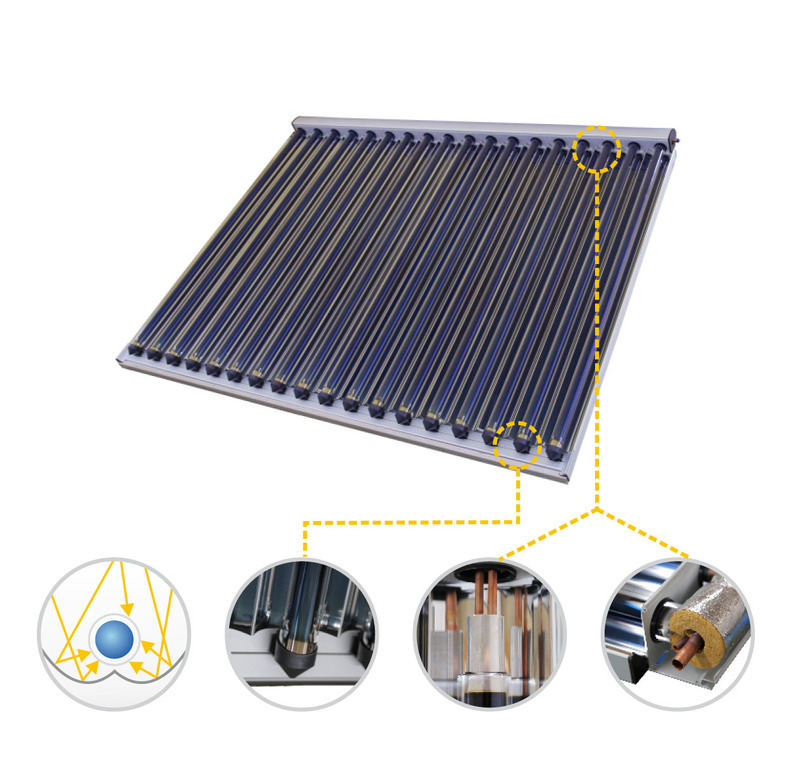 This CPC-reflector made in Germany can improve the heat-collecting efficiency by 15%. The CPC-reflector is produced from a metal sheet with protective coating using accurate roll forming technology and enamel mirror technology. The special coating on the mirror is a valid anti – corrosion proces sing for the reflect or. Due to unique fastening technology the CPC-reflector can be exchanged without using tools . The vacuum tube collect or without CPC-reflector has high energy yield due to special collector structure that contains vacuum tubes with highly selective absorber layer, U-shaped copper pipes inside vacuum tube for heat transport and aluminum heat transfer plate between copper pipes and vacuum tubes . Compared to the series with CPC-relfector, this type of collector is specially developed for specific installation area and climate environment that needs to be protected against strong wind or heavy snow. Specially developed for specific installations that needs to be protected against strong wind / heavy snow. Short installation times due to complete pre-assembly collectors. 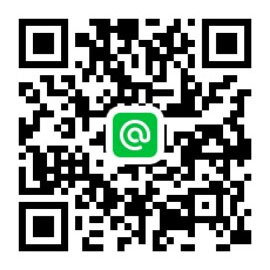 for water, space and process heating with 70oC ~ 90oC temperature requirement. The vacuum heat pipe collector applies gravity as sisted heat pipes as core heat conduction component and vacuum tubes with special coatings for heat absorber. This type of collector is suit able for applications with low ambient temperatures and has fast system starting. Operating at minimum ambient temperature of – 30oC to maximum operating temperature of 90oC. Season independent operation depending on the heat transfer medium. High flexibility due to the different widths and lengths of the collectors. Anti-freezing medium in the solar circulaion loop to ensure hot water on cold days. Short installation times due to complete preassembled collectors. Manageable module sizes for a high performance. 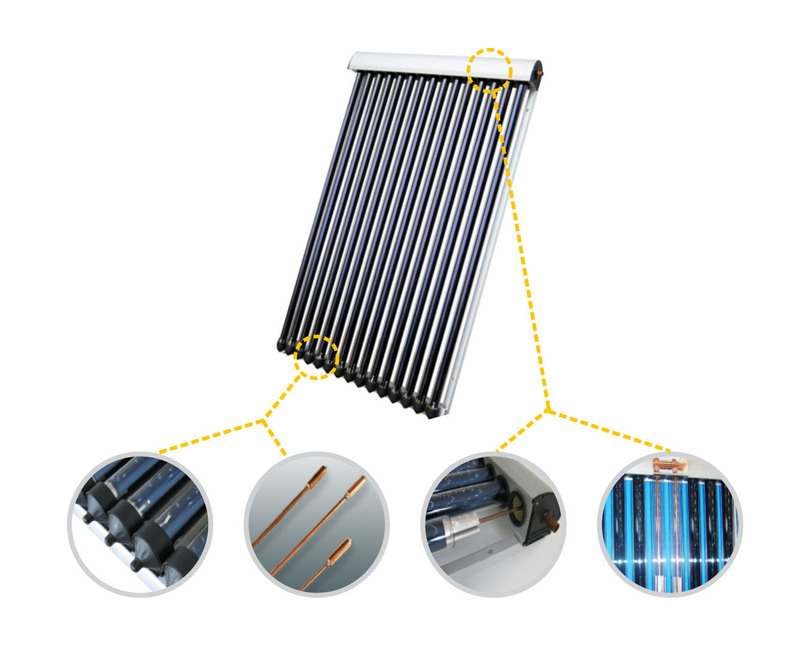 The vacuum heat pipe technology uses the maximum fraction of solar irradiation at minimum ambient temper atures of – 30oC and maximum operating temperatures to 90oC. Sunlight is captured by the coated vacuum tubes which absorb the radiation as heat and conduct it to the heat pipe through aluminum heat trans fer plate. The heat trans fer medium inside heat pipes vaporizes and the vapor rapidely rises to the top. releasing the heat and condenses to for mali quid and returns to the pipe bottom where it evaporated again and repeats in cycle. * actual operating ambient temperature is in dependence on respective heat trans fer medium. for water, space and process heating with 60oC ~ 80oC temperature requirement. LPC vacuum tube collector is a economic selection for hot water generation and process heating. Due to succinct collector structure with vacuum tubes and manifold, it has long operating life time but short pay back period. Long operating life time but low in maintenance costs and repair requirements. High- quality stainless steel inner tank maintains good water quality. 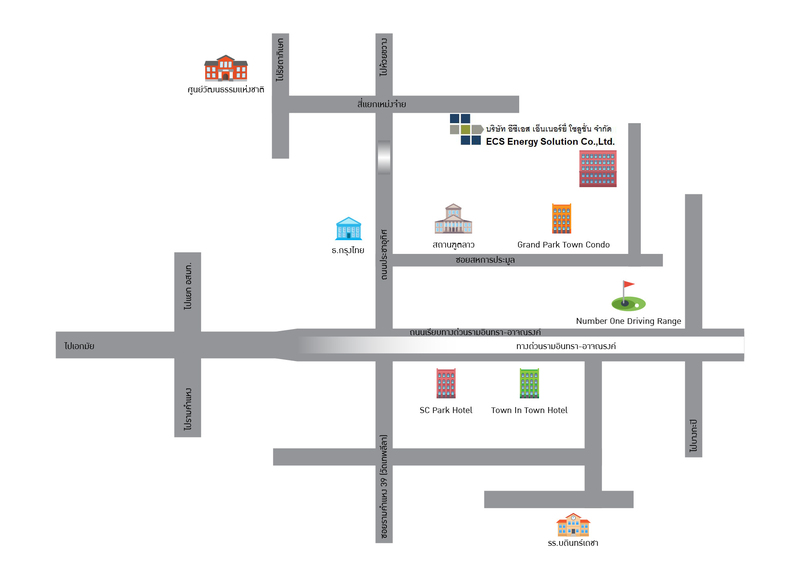 Applicable for regions with different temperature environment . The Flat plate collector has higher efficiency for application temperature range under 55oC. With high quality selective PVD blue titanium coating / plating black chrome coating and multiple insulation technologies , the flat plate collector has high absorption rate, low emission rate and excellent heat preservation performance. Higher efficiency for temperature range under 55oC. Short installation times due to complete pre-assembled collectors. Without over heating problem in summer season.